In the summertime, Palermitans escape the city heat and grit and head to the beach in Mondello. You can access it easily by taking a direct bus (#806) from Piazza Sturzo in Palermo. It's about a 30-minute ride, and you can get a nice glimpse of where Palermo's elite live by looking out the window at the beautiful houses on the way. When you return to Palermo in the evening, be prepared to wiggle your way onto standing-room only buses. Ours featured a lively group of pre-teens singing American pop songs at the top of their lungs. A visit to Mondello is a great lesson in the beach culture of Palermitans. Because of its proximity to Palermo (it's basically a suburb), people visit the beach for the whole day, rather than an extended vacation. This requires a lot of planning and preparation so that no detail is forgotten, and the visit is as pleasurable as possible. Families bring huge coolers of food, comfy beach chairs, entertainment for children and adults alike. 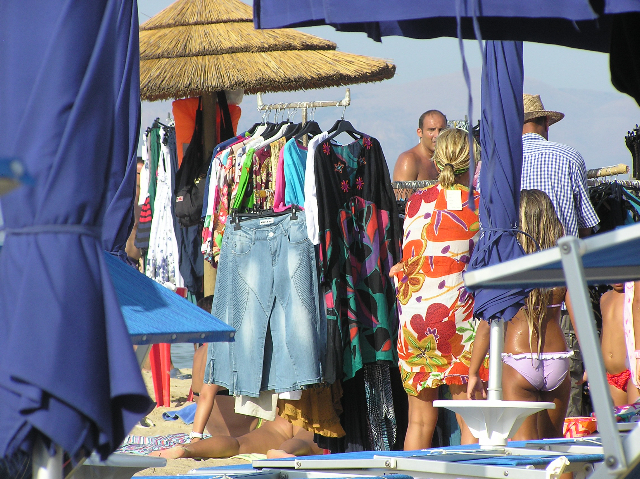 Women take advantage of the moving "bazaars" on the beach, trying on different dresses and jewelry, consulting with their boyfriends and husbands, and bargaining with the sellers until they score the latest addition to their wardrobe. Along the roadside, there are many food shacks selling quick and easy beach food: pizzette, panelle, arancini, panini, granite, and the like. Also, if nightlife is your scene, the club and bar hotspots move from Palermo to Mondello during the summer months.